I’m so excited that I’ll be leaving for Sewing Summit in Salt Lake in just a couple of days. I spent the weekend gathering my supplies and making a list of what to work on so I will be prepared for non-stop sewing fun! We recently cleaned up my son’s room and put up new shelving as part of my sewing space redo. Since I moved his Legos out of my sewing loft, I had to give him more space to store his stuff! 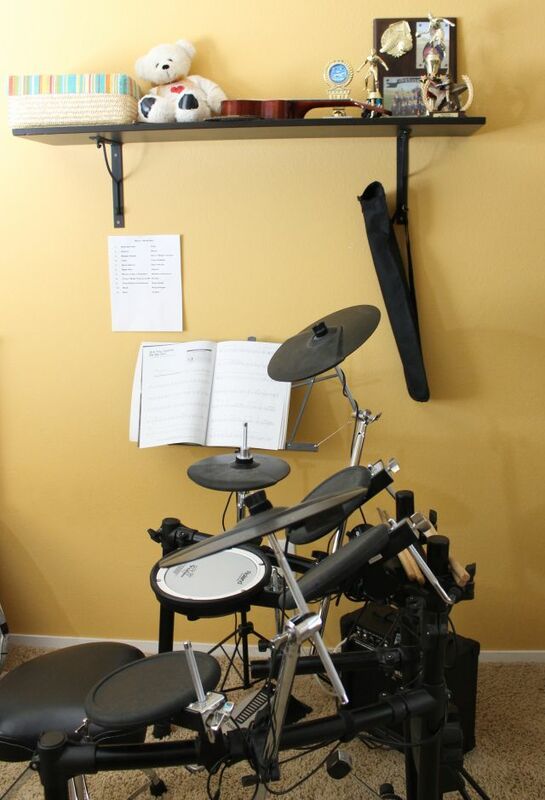 He has an electronic drum set that takes up most of his room (yes – I’m that kind of mom!) so we really need to cozy it up a little. I decided he needs a new quilt that matched the color scheme of his room. He’s into Yugioh, drums, space, and Tron. Fortunately, the furniture and decor in his room blend together in a nice palette of black, blue, grey, and cheddar. I told him that I get to design the front, but he gets to choose the back. Since I created the design in EQ7 I was able to print it off in color and pull matching Kona Solids to match (one of the perks of having a fabric store in the house). 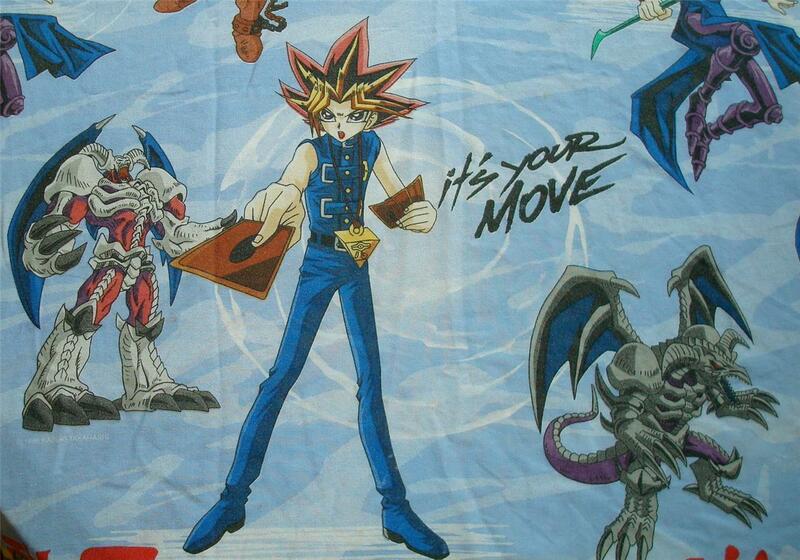 I found this fabulous Yugioh sheet online for a song that I will use for the backing (thanks to a bit of google searching). He was way excited about that. I get to make a fun quilt and he’s happy with the backing and colors so it’s a win-win! Next up, I’m going to try my best to finish up my Sunday Sling bag that I started in a class over 2 years ago! Each time I go to a retreat or quilting event I’m so jealous of all the cute hand-made bags everyone is wearing. This is how far I’ve gotten in 2 years, LOL! So wish me luck as I frantically try to get ready this week. I’ve posted a list of classes I’m taking here and I’ve already heard from a few other blogger friends who are going – it’s going to be great! have a great time…may I suggest using the sheet to make pillowcases for his bed rather than the backing…as his interest will change and his beautiful quilt will still be in vogue with a more neutral backing. Good for you with the drums – I’m a big fan of supporting our kids’ musical and artistic interests! I’m working on the 2 charming chevrons for my grandsons and finished piecing the top of the first one over the weekend. I changed the direction of my points as well!! I was hesitant at first but then thought through how I will quilt it and sewed the rows together! I’ll have to post a pic later today on Flickr. Have a great time at the Sewing Summit!! The Yugioh sheet looks great with your chevron design, even the colors. Great score! It sounds like it will be a fabulous time. 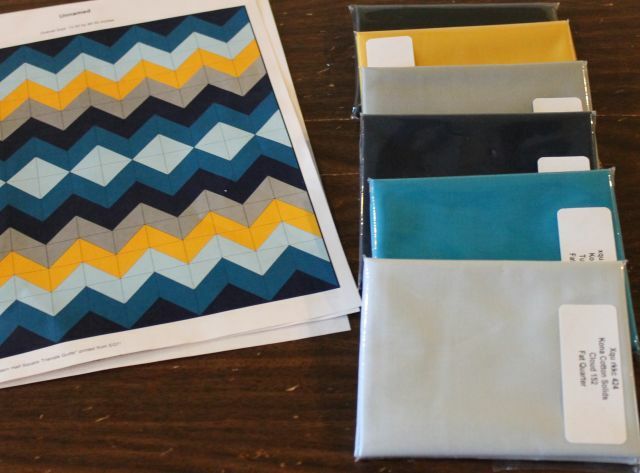 I love the fabrics for the new chevron. That will be gorgeous. Great plan for the new quilt. Your son will love it! Concerning the bag… I was just thinking the same thing yesterday. Two dimensional projects are where it’s at! PS. I am sew jelly! Have fun at Sewing Summit! This will be a fabulous quilt! 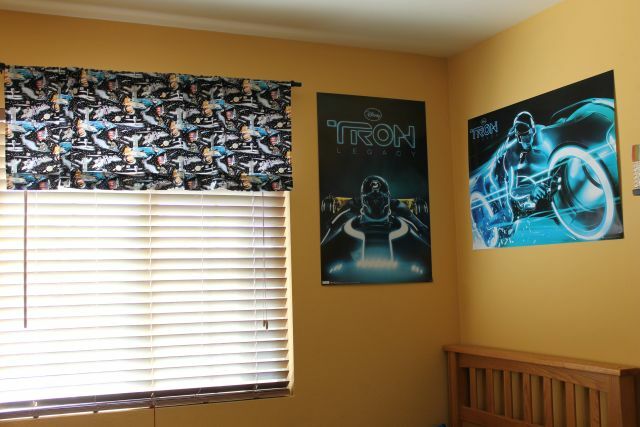 Perfect colours for his room…you will get the Mom of the year award! Have fun at the Summit! What a great looking quilt for your son – love the color scheme for it. Sounds like you’ll have a busy week! Good luck! 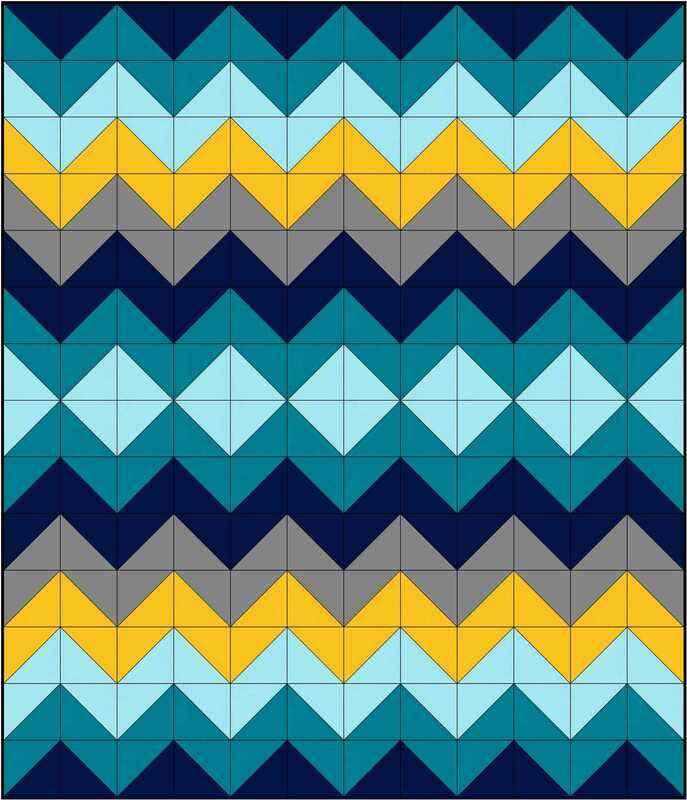 Your chevron design looks fabulous and go ,you can make all your projects.Have a lot of fun and enjoy!! I have faith in you! You CAN and will get the bag done!! I can’t wait to see it! Or the quilt! That will be one very cool quilt. I so wish I was going to Sewing Summit this year. I’m not going to miss it in 2014. What a lovely design and colors. Love to see the fun quilt finished with that awesome fabric. Good luck with your bag, 3D sewing is not that different! That chevron quilt is going to be amazing!! Wow! I love your quilt design and color choices!! Love the center transition point in your chevron quilt! The colors are outstanding. Sounds to me like your sewing summit will be wonderful. That bag is so much fun, colors are great! Good luck. Have a great time and stay safe! I love the color choices for the new quilt, very nice! Oh Christa, I’m soooo envious! Have a great time. Can’t wait until the guild retreat. : ) And love the new quilt. Envy!!! Expect great posts/photos!!! Enjoy!…..
Looks like a lot of fun! Love the colors and that the chevrons change direction in the middle.